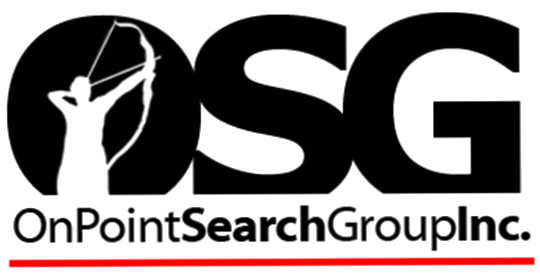 Why go it alone when you can have the expertise and industry connections of Onpoint Search Group Inc. working for you? If you are like most professionals, you don’t have time to scour the Internet and newspaper ads looking for job opportunities. At our executive search firm, we take the search out of your hands and minimize the hassle. Our goal is to put you in a position to be successful. We strive to ensure long-term, mutually beneficial relationships between you and our clients. We are interested in your growth and your future. Our mission at Onpoint Search Group Inc. is to deliver the person you are looking for in a time frame that best suits your needs. We are successful at what we do because we have an extensive network and comprehensive database of professionals who have highly desirable skills. These professionals are often times not actively looking for a new position, and it is possible that some of these candidates may even be employed by your competition. We have access to these candidates and can bring them to your company. Onpoint Search Group Inc. is the North East’s premier employment resource dedicated to the Construction and Engineering industries. We are owned and managed by professionals who possess an in-depth knowledge of different industries and the business challenges our clients face every day. By freeing up your valuable time and resources, we allow you to concentrate on what you do best. Our company’s strict focus is just one of the things that sets us apart from our competitors. Whether you are looking for a new career opportunity or looking to hire quality people, we have the network of contacts and the recruitment skills to help you succeed. As industry leaders in the field of executive recruitment, our core competency is to engage qualified candidates, recruit them by focusing on mutual needs, facilitate the recruitment process, and facilitate and monitor the transition process. Our founder, Conrad Martin, has been in the recruiting and staffing industries since 1998. He has a history of excellence throughout his career and has consistently been a top performer for the organizations he has worked for. Prior to founding Onpoint Search Group Inc., Conrad was a Regional Sales Manager with CLP Resources where he led the nation in new client generation and was the top performing sales manager three years running. He established Onpoint Search Group Inc. in 2007, where he continues his work of locating top talent for his clients. "Conrad listened to my wants and needs for a career move, and delivered! He was very helpful, not only in helping me find a new job, but with interviewing and resigning gracefully. Can't wait to start my new job, thanks Conrad!" Project Engineer Boston Area G.C. "Conrad Martin is a Top-Notch Recruiter. He found me that perfect position I was looking for. He wasn't done there... He followed up in moving me along the whole employment process. If you need assistance finding "The Right" job, let Conrad do it for you. Philip Lewis Natural Gas Specialists Utility HVAC." "Conrad is very sensitive to his client's needs. He doesn't waste time pondering which avenue to take when finding the best fit for his clients. He has an innate ability to create a client/company fit, and takes special care when dealing with both. I would recommend Conrad to anyone in the construction management field in the future." Construction Superintendent Boston Area G.C. Copyright © 2019 OnPoint Search Group – Construction Recruiter – Powered by Customify.